When genres clash, it’s often a question of how well the result will be. Galacide is a fast paced bullet hell shoot em up with puzzle elements. The result is what the developers call a ‘shmuzzler’. The official website has done something interesting too as the official site is: www.galaci.de. An original fitting use of the .de extension. You are a pilot that scours the galaxy in search of precious minerals. On one of those missions, a threat emerges, namely a violent alien race, out to devour all the precious minerals, crosses your path. 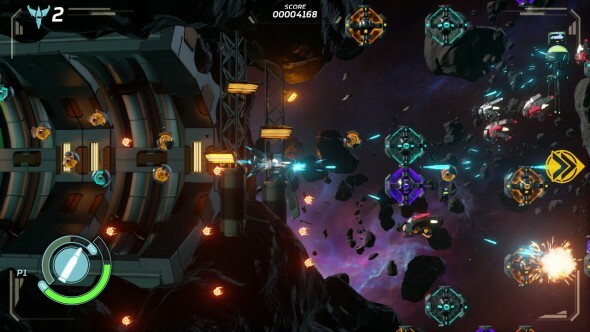 You fight your way through the hordes of alien spaceships and smash obstacles separating you from your goal. The story continues as you progress through the zones. This is done by way of conversations between you and the other members of your crew. The parts in the beginning of the level are usually not hard to follow as there are no enemies for you to focus on, but as you go through the level, they might start up and focusing on shooting, dodging and puzzling is just a little too much at times. The writing is decent, not overly dramatic, even though the plot feels like it’s beating a dead horse. 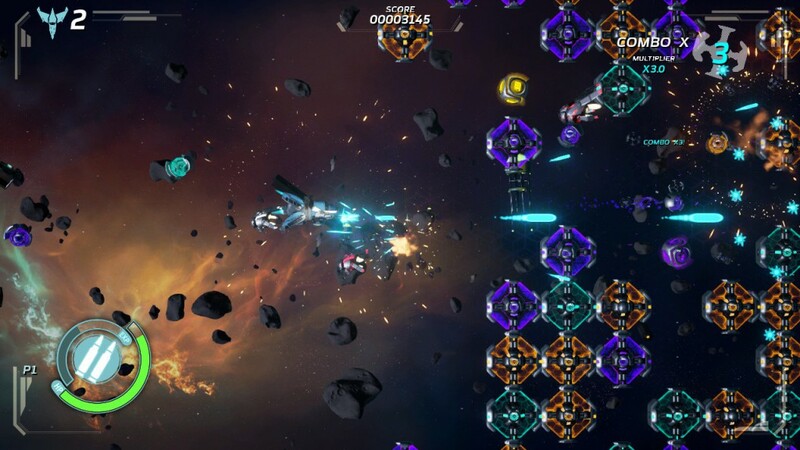 The graphics of Galacide can be described as flashy as there are a lot of things blinking and a ton of colors are on screen at any given time during a level. This makes it so it can become a pain to play for longer periods of time. Not to mention it can become hard to focus on the puzzle pieces and the enemies that are on screen alongside dodging their gunfire and creating a pathway for you to pass through. The enemies that will cross your path are the Bits, these little blighters come in small varieties. The bigger bosses, however, have really cool designs.Whatever the smaller bits lack in design, the bosses make up for. Framerate wise, there are no drops, even when the action on screen is in full blast. The movement is fluid and there is no jerkiness or screen tearing whatsoever. The strange thing about the soundtrack of Galacide is that it’s almost a complete opposite of the gameplay. Where the gameplay is chaotic and wild, the soundtrack is more soothing. The fact that the music has a calming effect is a good thing as it helps you focus and staying alert by not distracting you. Your guns sound like they pack a punch and as they get upgraded, they sound increasingly more powerful. A little voice acting wouldn’t have gone amiss. 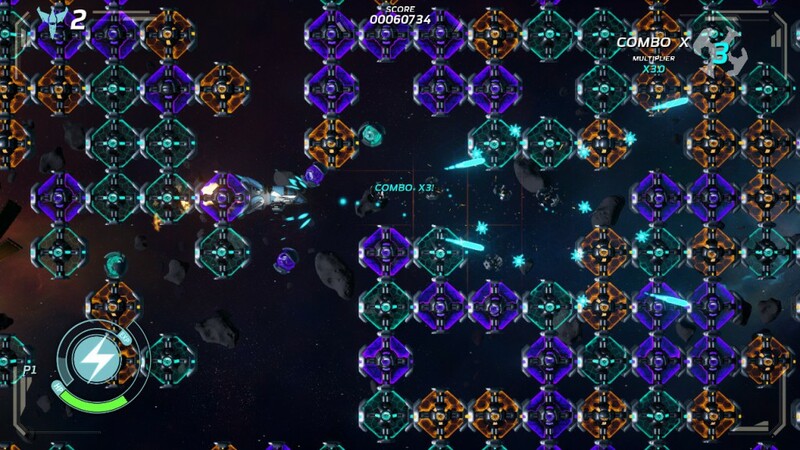 Galacide is a bullet hell puzzle game and as strange as that might sound, the concept is actually really interesting and has been executed really well. The controls are really simple and they can be customized to your liking. You can shoot enemies who explode and turn into colored scrap for you to pick up and fire at the same coloured blocks. If four of them are connected then they’ll explode. There are three different ships and each have their own powers, so which one suits your playstyle is entirely up to you. You don’t start off with all three of them, you have to unlock them, but once you’ve received them you can replay earlier levels at your leisure. While you are shooting down enemies and turrets, you’ll also come across upgrades to your ship. There’s the health upgrade, which restores health. There’s the firepower upgrade that powers up your vessels weapon, there’s the speed upgrade, which makes your ship shoot faster. Your gun can also be upgraded and downgraded. The way this works is that when you’ve completed higher combos the meter goes up and your weapon becomes stronger, as you progress through the level and you don’t make any combos the meter depletes and your weapon goes down in power. The game is chaotic and there’s a lot to take in. 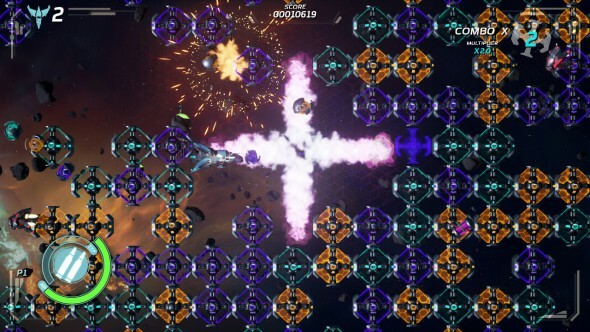 Bullet hell shooter games can be stressful as the screen is filled with bullets to dodge, but Galacide ups the ante even further. The screen will fill itself with bullets and you’ll be restricted by the path you’ve created if you want to dodge the bullets. If you mess up a chain of blocks, fret not, getting really close with a block of the right color will change the colors of the blocks with the block you shot over it. It takes some timing and doing this while dodging, and making sure you’ve a path to go through at all times can be really difficult to pull off, especially during the higher difficulties of the game. Life and death go hand in hand, and in Galacide it’s no different. You are granted 3 lives at any stage and when your life bar is depleted, or you’re stuck in a corner, you die. When you respawn, everything around you explodes and you are given a brief window of opportunity to clear the path again. It’s a great mechanic that allows you to get back on top if you’ve gotten a little bad luck on the scrap placing part. If you take up those higher difficulties and you can’t really pull it off, you can always team up with up to four friends and tackle the level that way. This way you can delegate the puzzles and created bigger chains more easily. Galacide isn’t only dodging bullets and tearing down blocks to get to the next level. The game also has a puzzle mode, in which you’ll have to solve a number of puzzles with progressing difficulty. Thinking ahead and outside of the box will help you in this mindboggling mode. Galacide takes on two completely different genres of gameplay and mashes them up quite successfully. If you are doubtful about how the two can be reconciled without feeling like a desperate cash grab, then worry not, the game really pulls it off and finds the perfect balance between challenging innovative gameplay without resorting to frustrating mechanics or gameplay elements. If you are looking for a game that isn’t a cookie cutter format, then you really should check it out.